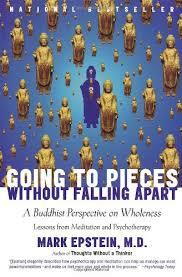 Going to Pieces Without Falling Apart: A Buddhist Perspective on Wholeness by Mark Epstein was a book I heard about from 10% Happier by Dan Harris, with Epstein written of as one of the people who got Harris interested in the practice of meditation. The title of Epstein's book refers to it being ok for for things to go wrong, just those things don't then have to become worse than they are. If bad events happen, they happen, if someone sad or feeling empty, it's not awful for them to feel that way and the toxic part isn't typically the situation, but the reaction to it. Epstein writes of how "happiness comes from letting go," which reminds me of Harris describing meditating as looking dispassionately upon one's situation and feelings. Related to this, another idea from Epstein is how people can often get so caught up in their emotional reaction to a situation they become paralyzed, one approach would be for someone to look past the current spot and at the next thing to come. Additionally, Epstein touched on something Harris noted, meditation doesn't have to involve sitting quietly by oneself in a room, however it occurs, meditation is about being explicitly aware of surroundings and feelings, not overwhelmed by them, but aware. The book definitely didn't feel as entertaining as 10% Happier, but was a quick read and had some interesting concepts to it.